Much as we've liked the Sony Bravia TVs that have come our way so far, they haven't been completely flawless. So we're only too pleased to get our hands on a sort of 'S-series Bravia MkII' in the shape of the KDL-32S2530. Surely this upgrade must put right at least some of our concerns. From the front it's hard to tell the KDL-32S2530 apart from the KDL-32S2000, as they're both attractive in their thin, nearly-black bezels. But there's a big change on the rear as Sony has finally provided a second HDMI input. This joins the usual connectivity roster of component video inputs, RGB Scarts, PC input and so on. The KDL-32S2530 introduces two other key improvements too. First up, a new dynamic contrast system adjusts the brightness output of the TV's backlight depending on how light or dark a particular scene is, upping the TV's claimed contrast ratio to 5000:1 compared with 1300:1 for the original S-series. The other key advance sees Sony's Live Colour Creation image processing (which improves the appearances of reds and greens) being brought down to the S-series having previously only appeared on Sony's V models or higher. Chuck in a digital tuner, Sony's wide viewing angle 'SPVA' technology and acclaimed Bravia Engine video processing, and you've got a really well specified effort for £900. The TV doesn't fall down on performance, either. It's not an absolute classic, but it's certainly always enjoyable. Probably its single greatest picture asset is its phenomenal sharpness, detectable throughout Superman Returns on HD DVD. The detailed shots of Lex Luthor's extravagant toy train room, for instance, look blisteringly clear and nicely textured. Black levels are also very good, handling dark scenes like the one where Superman spies on Lois from outside her home unusually well. The night skies look black rather than grey (much more so than with the old S-series models), and there's lots of shadow detail in evidence. 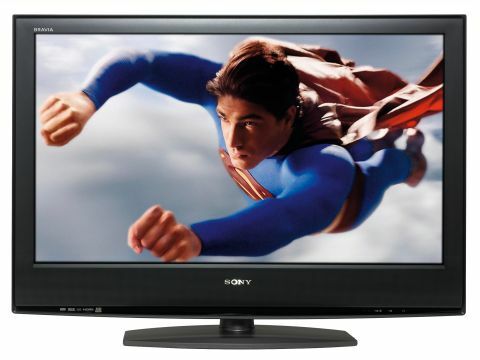 Colours are vibrant too, helping Superman's red and blue outfit look suitably radiant during daytime scenes, and there's practically no video noise of any sort, even when switching to standard definition - proof of the excellence of Sony's Bravia Engine processing. Despite all the good stuff on display, there are two issues that stop the TV from quite earning five stars, though. First, although colours are vibrant, occasionally they look a touch unnatural, at least during dark scenes. Secondly, as Superman bombs through the sky, he can look a touch blurred as the response time struggles to keep up. Sony's KDL-32S2530 is a worthy improvement over what was already a good TV selling for a pleasingly approachable price.